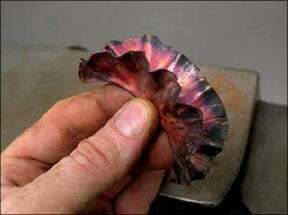 This article talks about a fold forming technique called lead or ruffle. Read on on the Steps on Making a Leaf or Ruffle as written by Charles Lewton-Brain. 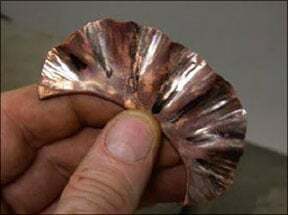 This fold is an example of forging on the open side, and introduces how to use hardness dams in fold forming. Dams are work hardened spots, lines, or patterns within the sheet. 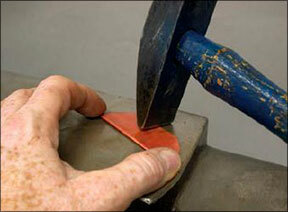 This form illustrates the way we can use hardness dams to direct the movement of metal under force. 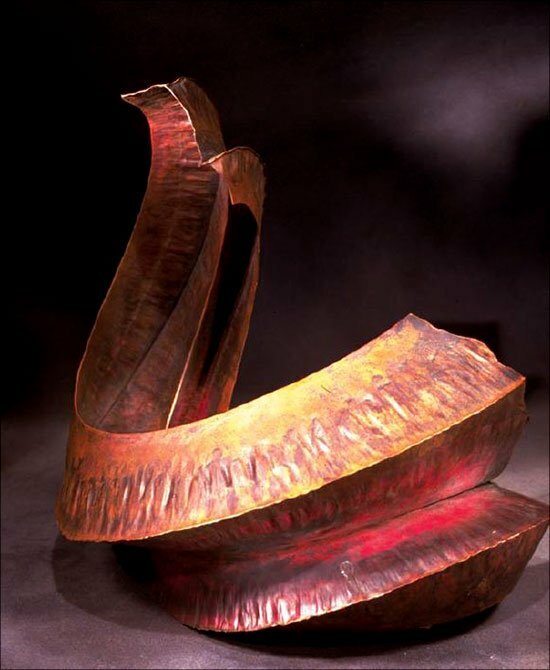 To avoid water splashing about the shop, I often cool annealed metal by placing it between two large blocks of steel. 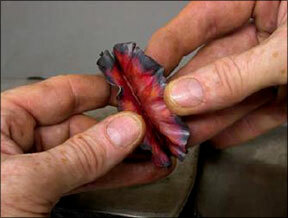 This is almost as fast as quenching and avoids trapping water in the recesses of the folds. Start by making a squat line-fold that forms a rectangle when folded and flattened. 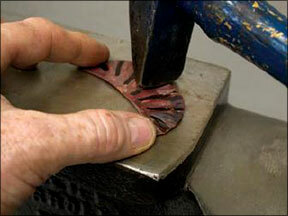 Trim the legs to a blunt curve with shears, then forge on the open side. Hammer along the open edges with a series of evenly spaced blows. This will cause the fold to curve. Hammer additional lines that radiate from the fold edge toward the open side, shown here in black marker. Carefully hammer on these lines to work harden them. Using the same hammer, hit in exactly the same places as before, but this time strike harder, so hard that the metal squirts sideways. 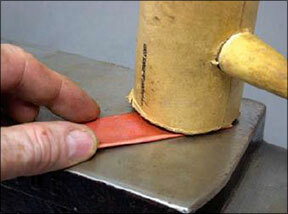 Because of the work hardness dams between the marks, the movement can no longer turn into curvature. 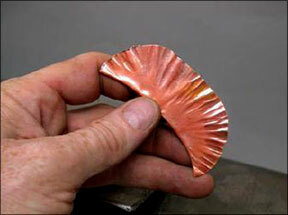 Instead, the annealed metal between the dams has no choice but to rise up into clear and distinct ruffles. 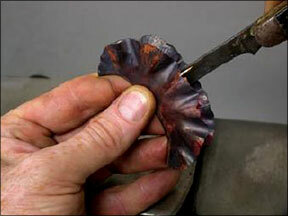 Use a blunt tool to start opening the annealed form. As always, open as much as possible with your fingers.